Navigate through the complexities of implementing a European R&D pipeline and managing regional Regulatory Affairs: from development to marketing approval and reimbursement, with a particular expertise in the preparation and submission of paediatric investigation plans. EPMC Pharma has been selected as an SME partner in the European FP7 initiative to develop new formulations of off-patent medicines for the at-term and pre-term new born. "Success in Europe opens the door to a region that places access to innovative health care as a priority for its citizens, and offers the credibility of passing the approval of one of the world’s most rigorous authorities"
Feel free to use our information request form. 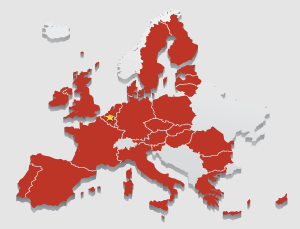 Located in the heart of Europe, EPMC Pharma supports pharmaceutical and biotech companies of all sizes to bring their products efficiently to market. The PDCO within the European Medicines Agency has given its approval for the Paediatric Investigation Plan for Fentanyl-citrate, in the prevention and treatment of acute pain in pre-term neonates, newly born child and those up to two years of age. © 2010-2019, EPMC Pharma. All rights reserved.